Assistant coach Paul Franks, who accepted that Notts got what they deserved in a heavy defeat against Lancashire. Assistant coach Paul Franks felt Nottinghamshire got what they deserved after they were “outplayed” by Lancashire in the Specsavers County Championship. Tabletopping Notts looked nothing like potential champions as they crashed to defeat by an innings and 67 runs in little more than two days at Trent Bridge, and against a Lancashire outfit they had beaten only a month earlier. Franks said: “If you don’t play at your best, then you get what you deserve. The frustrating thing from everybody’s point of view is that we didn’t reach anything like the levels that we expect and certainly the levels that we produced last week against Hampshire. 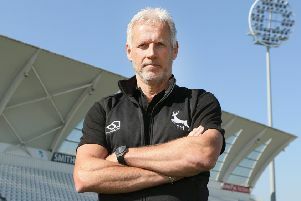 One of the visitors’ heroes was former England bowler Graham Onions, whose liking for Trent Bridge was confirmed by a return of 6-55 in Notts’s woeful second innings. Onions, who once took nine wickets in an innings on the same ground for Durham, said: “It was brilliant. There has been a lot of hard work over the last six weeks, so to get a win against a top side is pretty special. Lancashire collected 22 poiunts for what was their first win of the campaign and their first away win in the Championship since 2015. Another of their heroes was England batsman Keaton Jennings, whose knock of 126 helped his side score 338 to open the match. Notts were then skittled for 133 and 138, with opener Jake Libby top scoring in both innings, first with 34 and then with 46. New signing Chris Nash continued his nightmare start to life at Trent Bridge by twice becoming a cheap victim of Onions, including for a duck in the second innings. Fellow new recruit, New Zealander Ross Taylor, fared even worse, falling for nought, trapped lbw by Onions, in both innings. The two sides meet yet again this Thursday when Notts Outlaws begin their defence of the Royal London One-Day Cup in a qualifying group tie at Old Trafford.